First of all, I would also like to pay tribute to both winners, Prof. Gregory Chow and Prof. Xiaohong Chen. The topic assigned by Mr. Xia Bin for me is “Theory to Practice” and I was invited to share with you my opinions on China’s economic trend since the 19th CPC National Congress. The 19th CPC National Congress, a great event for China’s politics, economics and society, will surely exert profound influence on future economic development. Tonight, I will start with the current economic situation and then talk about my opinions of economic operation mechanism, including cyclic fluctuation and structural problems under a framework of logic self-consistency. On this basis, I will then probe into how future economic development will be influenced by the new theories and political orientation put forward at the 19th CPC National Congress. Now the first point is it seems that traditional economic cycle is disappearing. This year the capital market is arguing whether there will be a new cycle. Some people believe that the new cycle has already begun or is about to begin while others hold a relatively pessimistic view that the new cycle will never come. How to consider this problem? If we look at some traditional economic cycle indicators such as GDP and inflation, the economic cycle is disappearing seemingly. China has achieved a very steady GDP growth over the past few years with decreasing fluctuations. Accordingly, the CPI inflation have been kept low and fluctuations have been declining. Apart from China, this also takes place in other regions such as the North America and the Europe. The U.S. has witnessed a lukewarm economic growth in recent years, which is better than a regression but does not live up to booming economy and increased inflation. This is also not a new phenomenon in the world. Before the global economic crisis, there was a buzzword called “the Great Moderation” period which describes a stable macroeconomic environment with less growth and inflation fluctuations. At that time, the market and the policy-makers all agreed this was a positive trend, and central banks in many European and Northern American countries even found the panacea to maintain a stable macro economy. However, the subsequent financial crisis showed that if there are less fluctuations in the short-term economic cycle, it would be a relatively huge impact once a fluctuation takes place, which is due to excessive financial expansion. Now isn’t the history repeating itself？The U.S. macro economy seems to go back to a stable stage, maintaining a lukewarm growth and a low-level inflation. Meanwhile, financial asset prices have been increasing; the U.S. housing prices go back or even exceeds its highs before the subprime crisis; and the U.S. stock indices continue to peak a historical high. China’s economy shows a similar pattern. Along with growing economy and stable inflation, the housing prices increase steadily. After the stock market crisis in 2015, the disparity between SSE 50 Index and SSE Composite Index has been widened and a few large-cap stocks and bank stocks have risen considerably. The key to understand macro economy is how we regard the phenomenon that real economy and finance are seemingly not compatible with each other in the short run and macro economy experiences less fluctuations in the short run but a big one in the middle stage. The second economic operation concern is the imbalanced structure. We have been talking about this for years, but statements of the principal contradiction transformation at the 19th CPC National Congress have laid unprecedented importance on the imbalanced development. What aspects embody the imbalanced development or structure? the first is imbalance between consumption and investment; the second is imbalance between industry and service sector, reflecting in sluggish development of service sector and overcapacity in industry; the third is imbalance between finance and real economy: finance should return to serve the real economy; the forth is imbalance between generations. The fertility rate of one generation has plummeted due to the family planning policy and the subsequent imbalance of labor force and wealth distribution between generations are the leading influencing factor for macroeconomic structure; the fifth is environmental pollution and we are deeply impressed by this problem in Beijing; the sixth is imbalanced regional development, and there are also disparity of income distribution and the gap between the rich and the poor. Among all the aspects, I think the most fundamental and the biggest imbalance is disparity of income distribution. Let’s look at some indicators of the imbalanced structure. The heavy industry had occupied an increasing share of the whole industry over ten-odd years, and the figure has just been stabilized in recent years. It brings a series of problems such as overcapacity and environmental pollution. For example, air pollution in Beijing, Tianjin and Hebei Province in 2016 had deteriorated notably comparing to its 2013 level. Another noteworthy indicator is the ever-increasing proportion of finance in GDP since 2006, which has now surpassed that of the U.S. that known as the financial power, and Japan. We now emphasize that finance should serve the real economy, but how to define this? Which way can better serve the real economy, issuing derivatives or corporate loans? Whether offering loans to high-pollution enterprises or enterprises with overcapacity is serving the real economy? It is difficult to give clear definitions in reality, and I think the final determinant will be distribution. The target of serving the real economy will be hard to reach with the ever-increasing proportion of finance in national income distribution. Bank for International Settlements recently published an interesting research paper, discovering that over the past few decades, the proportion of financial scale (measured by credit amount) to GDP has been rising continuously, which was surely related to the financial liberalization, deregulation, easing market access and fiercer financial competition. In most industries, the fiercer competition and the increasing market participants and supply means reduced unit costs of products. However, the empirical conclusion drawn by this paper is that the unit cost of credit amount hadn’t decrease over the past few decades, which means that financial expansion and competitions in the financial market didn’t result in the drop of unit cost of finance serving the real economy. However, the upsurge of credit amount would definitely lead to increase of proportion of finance to national economy distribution. Therefore, this is a global phenomenon that not exclusive to China. Finance develops to serve itself more than serving the real economy. The imbalanced structure is also reflected in wealth distribution imbalance or possession imbalance, although China has stepped into the high-income phase from the middle-income phase with considerably accumulated wealth and increased life quality. According to the National Bureau of Statistics, Income Gini Coefficient has decreased over the past few years due to labor supply shortage and increase of workers’ incomes, but Wealth Gini Coefficient has risen sharply. Is wealth disparity more important or current income disparity? There is an economic term called “permanent income” that is represented by wealth, so wealth disparity is much more important than current income disparity as the widening gap between the rich and the poor is a significant aspect in imbalanced development. Besides, comparing to other countries, real estate accounts a high proportion in Chinese citizens’ wealth at nearly 70%, but this figure is only 36% in the U.S., which means the majority of our wealth goes to unproductive capital or low-flow assets. In other words, our possession of wealth is more like sharing an existing cake instead of making it a bigger one. In conclusion, now traditional short-term fluctuations in economy are decreasing, and finance is expanding. According to other countries’ experience, procyclicality of finance may bring relatively big impact to the real economy in the middle stage. Meanwhile, imbalanced economic development can be reflected in different aspects, of which the most fundamental one is disparity between income and distribution. How does this happen? Is there a framework of logic self-consistency for analyzing such problems of cycle and structure? On this basis, I suggested that we should view economics in a perspective of financial cycle. After the 2008 financial crisis, international academic community, policy-making institutions, especially Bank for International Settlements and IMF put forward the concept of financial cycle and related research has been growing. I was among the first group of domestic researchers who elaborated on the financial cycle. Financial cycle, originated from procyclicality of finance, brings about less frequent influences of financial fluctuations on macro economy comparing to traditional economic fluctuations. However, once the assets bubble pops, the subsequent financial crisis will generate huge ecomomic impact. There are a bunch of hypothesis on why finance has procyclicality, but one common consensus is that real estate is the most fundamental and principal factor of financial procyclicality because it is the mortgage of credit. A bank requires a mortgage to issue a loan due to information asymmetry. What is the best mortgage? The answer is real estate since its long duration and payback period is incomparable by any other productive capital even human resource capital. Real estate, the mortgage, and bank credit promote each other, expanding credit scale and bringing up housing prices; rising housing prices lead to the increase of mortgage value, so banks are more willing to offer loans; the spiraling housing prices continue till the bubble pops, and then housing prices drop, reversing the whole process. From rise of housing prices and leveraging to drop of housing prices and deleveraging, this is the so-called financial cycle. What’s the difference between the financial cycle and the economic cycle? The first is time difference. A complete financial cycle lasts approximately 15 to 20 years and an economic cycle 1 to 8 years. Typical indicators of the traditional economic cycle are economic growth and inflation while those of the financial cycle are bank credit and real estate prices. We estimated the financial cycle in China, the U.S. and the Eurozone according to bank credit and real estate prices by putting aside short-term fluctuations and only analyzing the middle-stage ones. We could see that the last turning point of the U.S. financial cycle was the subprime crisis, and after years of struggling adjustments, housing prices went down and deleveraging was achieved; such adjustment bottomed out in the second half of 2013 and from then on, the U.S. started a new financial cycle, entering an ascent economic stage. That’s why the U.S. economy has performed pretty well in recent years and the Federal Reserve began its “interest-rate-raising” period. The turning point of Eurozone’s financial cycle was EU debt crisis in 2011, which seemingly related to debt crisis of the governments in Southern European countries such as Greek and Spain, but the fundamental cause was real estate bubbles and expansion of bank credit. There are no independent central banks in Greek and Spain, so once banks malfunctioned after the burst of real estate bubble, only government rescues are available, resulting in bank debt crisis turning into government debt crisis. When the U.S. and the Eurozone was in the second half of financial cycle adjustment, China’s economy was right in the booming period of its financial cycle during the past decade. We could say that it was China’s booming financial cycle, prosperous real estate and credit expansion that saved global economy in the past decade when the U.S. and Eurozone were stuck in the second half of their financial cycle adjustments. Then how to regard the future? The U.S. financial cycle is showing the upward trend again and that of Europe will soon hit the bottom, so I think we should take good advantage of the upward trend of financial cycle in the U.S. and Europe in the next few years and grasp the good opportunities of favorable overseas market demands to improve our own financial cycle adjustment. 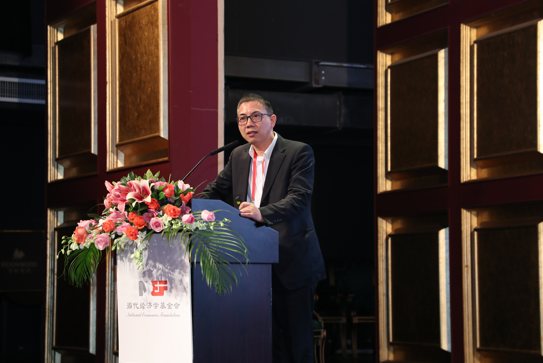 The financial cycle in China is about to top, which means we are faced to highest financial risks, so that’s why financial regulation was emphasized at this year’s National Financial Work Conference. I don’t know whether you have noticed that the implementation report of Chinese monetary policy published by PBOC today first mentions the concept of “financial cycle”, stressing a Twin Pillar Adjustment Framework (monetary policy and macro-prudential assessments). Talking about financial expansion, generally we will connect it to the impact brought by financial risks and financial crisis to economic aggregate. As far as I am concerned, under its framework and the condition that most financial institutions are state-owned, China will be less likely to suffer from systematic financial crisis like the U.S. did. However, it doesn’t mean there is no problem. China is influenced by another aspect. The financial cycle contributes to above-mentioned imbalanced Chinese economic structure. The expansion of finance and real estate bring structural distortions, increasingly squeezing capital supply for the real economy. Let’s see some indicators. We have sorted out financial statements of nearly 3000 listed companies in China and classified them according to different industries to explore which industries occupy higher debt ratios in the total (namely which industries occupy more credit resources). The first is real estate and the second is construction, which is in line with the concept of financial cycle we discussed that the credit expansion is related to real estate. However, real economy sectors such as food and drinks, computer, textile and clothes and light industry make up a small proportion. Implicit government guarantee for non-financial sectors is a particularly prominent problem in China. On the basis of stock option prices and the bond risk premium, we estimated disparity of hidden expected revenue between stock and bond. The disparity reflects the possible value of implicit government guarantee. Real estate, steel and construction rank top three by industry respectively, which means real estate and related industries enjoy the most implicit government guarantee. By ownership, the government grants more implicit guarantee to state-owned enterprises than private ones. Particularly after 2008, we saw a further increase of implicit guarantee to state-owned enterprises and a further decrease of that to private ones. We are talking about deleveraging, but in which aspects? Leverage is always structural. There is no overall leverage because one’s liabilities are the other’s assets. Our leverage is mainly in two aspects. The first is the comparison of leverage ratios state-owned enterprises and private enterprises (debt to assets ratio). Debt to assets ratio of state-owned enterprises rose steadily after 2008 and now gets stabilized while that of private enterprises decreased after 2008. The second is the comparison of leverage ratios by industry. Leverage ratio of real estate is the highest, rising steadily and the second is that of industries with overcapacity. As a result, two key areas of deleveraging are state-owned enterprises and the real estate industry. Besides, expansion of financial cycle has widened the gap between the rich and the poor. Of course we don’t have comprehensive statistics. We estimated elasticity coefficient of actual income growth to M2 growth rate in different industries, in other words, we estimated income changes in different industries with per 1 percent increase of M2 growth. According to the ranking, the bank and insurance industry ranks the first and real estate the second. It is reasonable because banks are suppliers of credit and real estate is the demander of credit. They promote each other, leading to prosperity in both financing and real estate industries, so employees in these two industries are the biggest beneficiaries. Environmental pollution is also related to the financial cycle. Prosperity of China’s financial cycle is notably different from that of the U.S. and Japan. Newly-built apartments are the main driving force of prosperity and transaction in China’s real estate industry. A portion of those new apartments are vacant dwellings, which were built to meet the investment demand instead of real housing needs. Increasing transaction of first-hand apartments can boost investments. However, the related upper stream industries such as steel and cement also bring environmental pollution. On the other hand, we can see ratios of second-hand apartment transactions to first-hand apartment ones in the U.S and Japan are much higher than that in China, which has little environmental influence. Besides, environmental pollution is also related to land finance supported by the prosperity of real estate, because investments led by the latter are not all effective. In brief, from the view of total fluctuation, the financial cycle accords with the macro economy’s characteristics that are small fluctuations in short term and big fluctuations in the middle stage. Meanwhile, the financial cycle influences the economic structure. Even a huge financial crisis doesn’t occur, the excessive expansion of real estate and financing will also result in structural distortion and imbalanced development. How to understand future economic development under the analytical framework of the financial cycle in combination with the new policy pattern after the 19th CPC National Congress? An important point put forward at the 19th CPC National Congress was the transformation of the principal contradiction, which is the contradiction between unbalanced and inadequate development and the people’s ever-growing needs for a better life. How to understand “unbalanced and inadequate development”? what does “unbalanced” mean? I have already expressed my opinions: the gap between the rich and the poor is the biggest imbalance. Prosperity of the financial cycle has widened the gap between the rich and the poor and the gap in turn promotes policies’ dependence on finance to help the low-income group and accelerates credit expansion. They are complementary. Look at some statements and policies related to economic development in the report of the 19th CPC National Congress, we can find many policies are made to promote fairness. Traditionally, it is believed in economics that fairness is contradictory to efficiency, so we cannot take both into account. However, after the global financial crisis, an increasing number of people argue that they can be achieved at the same time. In two income distribution stages, the primary income distribution is efficiency-oriented. There are some distortions in this stage, which can be corrected to improve both fairness and efficiency. In accordance to the practical situation in China, one distortion refers to power rent-seeking, which is neither fair nor efficient. Another one is real estate. Land is a special productive factor. Different from price increases of other productive factors that can be offset by improving efficiency through competition, the rise of land price can only be offset by rising costs of other industries due to the monopoly property of land. How do we deal with these two problems in the first income distribution stage? Anti-graft campaign has been stepped up continuously and we have seen notable achievements. Now the government begins to emphasize long-effect mechanism of real estate. General Secretary said, “houses are built to be inhabited, not for speculation.” Hence the two biggest distortions in the first income distribution stage are being corrected. However, problems also exist in the second stage. Comparing proportion of governmental transfer payment to individuals to public finance expenditure in China and the U.S., we can find that China’s figure is much smaller than that of the U.S., which means that structure of fiscal expenditure still remains to be improved. The report of the 19th CPC National Congress stresses the facilitation of basic public service equalization, which in fact requires transformation of fiscal expenditure structure. The Ministry of Finance suggests in the report of the 19th CPC National Congress that special transfer payment should be cut down, and general transfer payment should be increased in the future. Special transfer payment was related to investment project and general transfer payment was more connected with social security in the past. The next are problems in taxation system. Turnover tax proportion in China is considerably higher than that in other countries, reaching 60%. What’s turnover tax? A turnover tax is similar to value-added tax that is paid by buyers. It firstly levy on consumption, and it actually levy more on medium-low income households, because the higher proportion of consumption to income is, the higher effective tax rate will be. These are problems in our taxation system. Countries that adopt the similar turnover rate as ours are Brazil and India, both of which have a wide gap between the rich and the poor. Current taxation structure is unreasonable. The tax is imposed on labor and consumption instead of capital and investment. Besides, the effective tax rate for a low-income household is higher. It is known to all that gap between the rich and the poor is a global phenomenon. there was a controversial subject not long ago. The gap between the rich and the poor in the U.S. is huge, but their consumption gap remains almost the same. Thus some people argue that in this case, why should we worry about the gap between the rich and the poor? Isn’t consumption the ultimate goal for earning money? If the consumption gap between the rich and the poor hasn’t been widened for decades, why the widening gap between them is a problem? This is the case in the U.S.. Why the huge gap between the rich and the poor does not lead to the widening consumption disparity? After comparing disposable income and market distribution income in the U.S., we find that the U.S. Treasury has made secondary income distribution in taxation and expenditure, which greatly narrows the gap of disposable income comparing to that of income in the first distribution stage. The stable disposable income gap can be attributed to the secondary income distribution. Accordingly, the fiscal and taxation system reform is particularly important in our future structural reform, of which two important aspects are improvement of fiscal expenditure structure and improvement of taxation structure. It has been specified at the 3rd Plenary Session of 18th CPC Central Committee that we should lower the indirect tax, or the turnover tax, and increase direct taxes, namely the personal income tax and the capital gains tax. Currently, the personal income tax is already very high, and the direct tax to be increased is the capital gains tax. Hence I think the rise of real estate tax will be promoted in the next few years. Coping with imbalanced development and promoting fairness are conducive to correction of structural distortions caused by financial cycle expansion; in other words, it is conductive to acceleration of financial cycle adjustment. Acceleration of financial cycle adjustment is certainly more in need of monetary and financial policies. Currently we are close to the peak of the financial cycle, so what factors could trigger the turning of the financial cycle? One is tight monetary policy and the other is tight credit. What is tight credit? It means enhancement of financial regulation. Now we have seen that our central bank has associated with several regulatory authorities to issue new regulatory requirements on asset management. The direction of financial regulation is quite clear after the National Financial Work Conference. A lot of market participants still take a chance on this, believing enhancement of regulation is just a temporal campaign. However, I think things go differently this time. Regulation is getting more and more standardized. For example, financial institutions focus on main business, and strict management and operation of financial license is conducted to make people do things according to possessed licenses. Besides, high-level regulatory authorities have laid emphasis on standardization of business in financial holdings and regulation on connected transactions between finance and real economy. Therefore, I think this represents a general directional change in financial regulation. There may be different views. Some say we should intensify competition in financing to improve efficiency, but like I’ve just said, the empirical research has proved that it is a global problem that finance accounts for an increasing share in the past few decades, especially in the case of China, there is a relatively small space for market clearing. If we do not regulate implicit government guarantees right now, the problem will become more serious. Currently, money goes to the pockets of people who are more adventurous, but the subsequent risks are left to the society, so enhancement of financial regulation will be a general future orientation. What’s more, environmental protection has been strengthened. The number of people being arrested, grilled and held accountable by Central Environmental Inspection Group are increasing. Execution efficiency has been greatly improved in the grass-root level. Certainly, enhancing environmental protection also influences macro economy on external pricing. the short-term influence will be quasi-stagflation resulting in increase of price and cost and decrease of consumption. Is this good or bad? I should say this is about the balance between people’s long-term life quality improvement and short-term growth. We now focus less on short-term growth, but put more emphasis on suitable mid-term growth, quality of economic growth and improvement of people’s life quality. At last, I would like to talk about macroeconomic outlook in 2018. From the perspective of the financial cycle, we should implement different policies since the U.S is in the upward period while we are approaching the peak of the financial cycle. according to our condition, we should implement “tight credit” policies to cushion the subsequent shock to economy; fiscal policies may be eased and expanded a little, especially when quasi-fiscal policy is relatively tight this year. Money policy is stable and neutral, which is in line with the requirement in “about-to-top” period. The U.S. is in an upward trend of the financial cycle; coupled with Trump’s attempt to ease financial regulation, it will ease credit and conduct credit expansion. Meanwhile, the tax reform and capital construction need fiscal expansion while tight monetary policy is a certain requirement for easing credit and public finance. Therefore, the U.S. will raise interest rate and reduce the balance sheet. In China, under the circumstances of tight credit and enhanced regulation, we can see a slowdown of credit expansion. Whether it is the M2 growth rate increase or the price and cost climbing, it will lead to an obvious economic slowdown next year compared with that of this year, and the growth decrease will depend on the change of future policy environment. The direction is very clear and I think the economic growth slowdown in this period is positive, because it will facilitate the financial cycle turning, which is conducive to improvement of economic structure. In brief, we should pay less attention to fluctuations of the traditional economic cycle, because small increase or drop of GDP is not a major economic problem. However, more importance should be attached to the possible influence brought by the financial cycle on economic fluctuations in the middle stage, which is not only a financial risk but also an implication of economic structure and imbalanced development in the current context of China. On this basis, we should understand macroeconomic policies in two general directions. The first is enhancing financial regulation and standardizing comprehensive financial operation, and the second is pushing forward fairness-oriented public policies. In this context, the overall macroeconomic policy should be stable and relative tight.